Baked risotto is a super easy way to make this delectable main dish recipe. 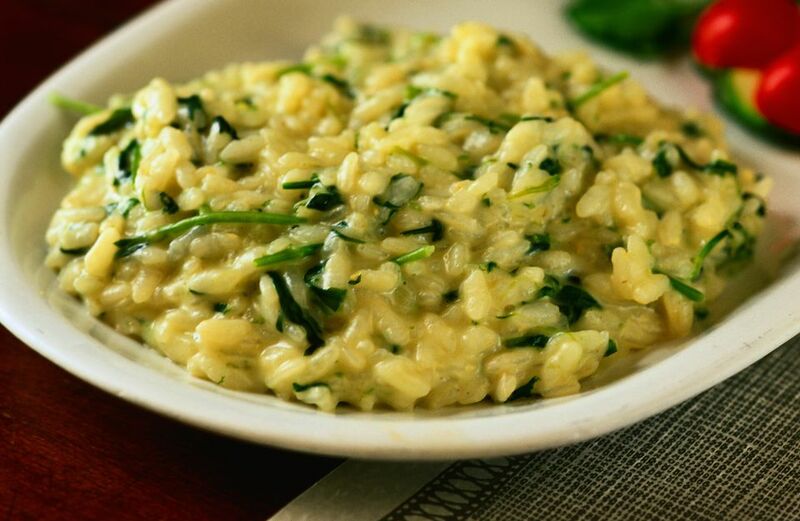 You'll need an ovenproof saucepan for this easy Italian risotto. When you stir it, be sure to stir from the bottom because the rice has a tendency to sink and stick. And be sure to use an oven mitt when you grab onto the hot handle! We speak from hard experience. The last time we made this we added some chopped ham and thawed frozen baby peas. You could also add some cooked chopped chicken or salmon, or some tender shrimp. Other veggies that would be good include asparagus and green beans. All you need to serve with this recipe is a green salad drizzled with a creamy vinaigrette and some toasted garlic bread. A glass of white wine completes the meal. In a heavy oven-proof saucepan with a tight-fitting lid, heat the olive oil over medium heat. Add the onion and garlic; cook and stir for 4 to 5 minutes until translucent. Add the rice; cook and stir for 4 to 5 minutes longer. Add the broth, basil, salt, and pepper and bring to a simmer, stirring frequently. Cover the pan with foil, then add the lid. Place in the oven. Bake for 20 minutes, then carefully remove from the oven, remove the lid and foil, and stir thoroughly. Return the foil and lid and place back in ​the oven. Bake 5 minutes longer. Test the rice to see if it's done, with a slight firmness in the center. If it is, stir in the cheese and butter, then let stand, covered, 5 minutes. If the rice isn't done, cover and return to the oven and bake 5 to 10 minutes longer. Then add the cheese and butter, stir, and let stand 5 minutes.